I approached my viewing of Chicago with an open mind. I was feeling optimistic — after all, I had went through a good run of musicals (Singin’ in the Rain, Moulin Rouge!, Dancer in the Dark) that made me look at the genre with renewed interest. Maybe I was being biased for no good reason and I just needed to see a few strong musicals to make me a fan. I was all set to love this, especially since the film was set in my city (albeit in the 1920s). All of the pieces were aligned, but alas, Chicago didn’t quite live up to my expectations. Based on the stage musical of the same name, Chicago revolves around two murderesses who are in jail and awaiting trial in the 1920s. Roxie Hart (Renée Zellweger) is charged with the murder of Fred Casely (Dominic West), her lover who never gave her the broadway gigs he promised her. She dreams of being a vaudeville star like Velma Kelly (Catherine Zeta-Jones), who is also sent to jail after killing her husband and sister, whom she finds in bed together. Faced with the prospect of death sentences, the two women enlist the services of highly talented lawyer Billy Flynn (Richard Gere) to set them free. There is also a sense of jealousy between the two women. Velma is the queen of the roost, so to speak, and she gets all of the headlines due to her past popularity. Roxie is envious of this and does everything she can to weasel her way into the newspapers — much to Velma’s dismay. 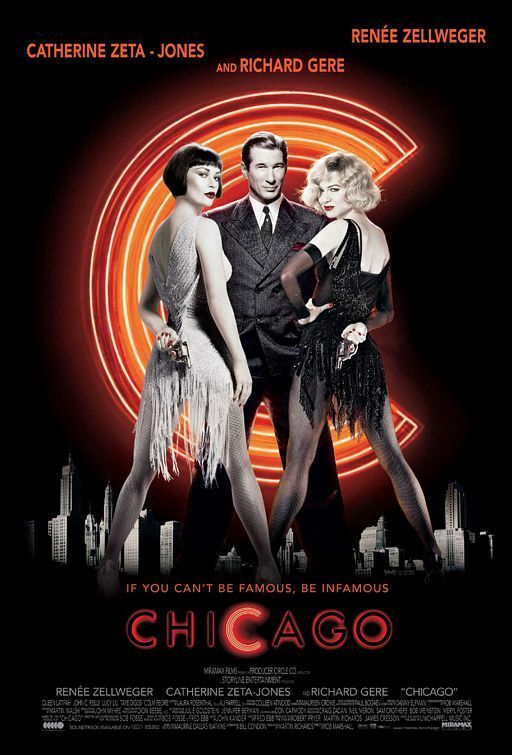 Now, while some may find interest in the satirical plot, the appeal of Chicago lies in its bombastic song-and-dance numbers. This is a film that revels in its visual style, piecing together large and exuberant dance routines with a distinct Jazz Age flair. The set pieces are fantastic; the costumes, flamboyant. It’s easy to get lost in the flashy showtunes, despite the fact that most songs are utterly forgettable. “All That Jazz” is a treat, but nothing else really left a mark on me. Ultimately, that is the biggest problem I had with Chicago. Outside of the glitz and the glamour, this is a film with very little substance. I enjoyed the spectacle of it all, but everything felt shallow, and I lacked any real connection to the characters or the proceedings. Taken on its merits, there is a certain amount of charm. I was just hoping for more… substance. Still, there are some brilliant performances that beg to be recognized, particularly that of Catherine Zeta-Jones. She is absolutely stunning as Velma Kelly, and it was always a treat to watch her on screen. I have no complaints about her winning an Oscar — she really is that damn good. Zellweger and Gere are also up to the task in their performances, though they did not leave as much of a lasting impression. Special mention should be made of two entertaining supporting roles — John C. Reilly as Amos Hart, Roxie’s cuckolded husband, and Queen Latifah as “Mama” Morton, the strong and independent matron of the Cook County Jail. While I did enjoy Chicago overall, I just didn’t connect with it in the way I was hoping. I get the appeal of it, and its visual style is certainly impressive, but it’s a bit of a head-scratcher as to how this won Best Picture in a year stacked with great films. I saw this quite a while ago but for some reason it didn’t really make an impression on me… and I do like musicals! I’m quite surprised it won Best Picture too, though Zeta-Jones did turn in a good performance. Whew. Glad to hear I’m not alone, especially coming from someone who enjoys musicals. I liked it. Quite a bit. Now, should it have beat out “The Two Towers” or “Gangs of New York”? I dont know. It’s close though, I dont know if this is a year I’d get all up in arms over. Atop of which, it WAS the return of the big budget musical. Which, with the Glee Effect doesnt seem like a big deal currently… but at the time, it had been eons since there was a good musical. Yeah, that’s a great point about this being the return of the big musical. Totally overlooked that, and I guess it makes sense in retrospect. I just feel as if it has lost some of its luster ten years later. When it comes to Oscar, the “feel good” movie is generally going to win. When you come out of the theater feeling higher than a kite as opposed to knowing you saw a great movie but feeling burdened, higher-than-a-kite trumps the others. Another excellent point. That does seem to be a recurring trend over the years (i.e. The King’s Speech, The Artist, Slumdog Millionaire). I saw Chicago this past year as well. I liked it, probably about as much as you did, but like you I don’t think it should have won Best Picture. I’d give it to Gangs of New York personally. But I think Chicago got a little bit of a “novelty boost” due to musicals not being a common things in recent years. Yeah, the lack of musicals before Chicago probably did give it a boost. Didn’t even think about that. As for Best Picture, I wouldn’t complain about Gangs of New York winning, but my personal favorite was City of God. Or maybe Punch-Drunk Love. There were plenty of great films that didn’t even get nominations, unfortunately. Always happens. Even with the expanded 10 slots, there are usually going to be great films left off. As long as there isn’t something awful that gets nominated in their stead, I’m OK with it. My feeling is that Best Picture should always be very debatable — otherwise, it’s basically saying only one film was really great, and that’s a pretty sad statement about a year. Yeah, very true. It’s impossible to get everyone to agree on one film anyway. The film definetly looks great and Zeta Jones is terrific, but I completely agree it lacked subtance. It was entertaining, but forgettablr. Yup, exactly. Glad I’m not alone on that. Quite proud of myself for not seeing this one… do I get Man Points? Haha… I take it you’re not a fan of musicals then, Scott? I have similar views about Chicago, but I think I may have liked it just a tad more. I’m also not a fan of the “musical”, but there’s more than a few that are definitely worthwhile, this being one of them. My favorite still remains Singin’ in the Rain due to its fantastic songs and numbers, not to mention Gene Kelly. I actually didn’t know you lived/were from Chicago (which of the two?). I’m a resident in any case, in the Lakeview area, thought I would mention it. Yep, I still live in Chicago! My first apartment here was actually in Lakeview as well, though now I am a bit north of there. I just saw Singin’ in the Rain for the first time a couple months ago, and I really enjoyed it. Probably my favorite musical so far. Haha I know exactly what you mean, man. Musicals are an acquired taste for sure, and there are only a few that I have really enjoyed. I prefered the stage version. Much more vibrant and intense.